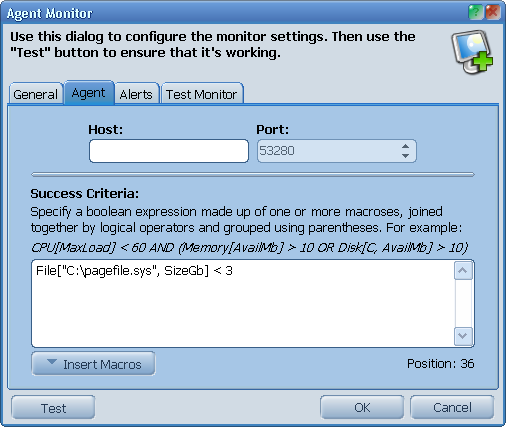 Agent monitor is a very powerful part of server monitoring software, that allows you to check simultaneously any number of system parameters of the remote Windows computer. In order to use this type of monitor, you need to install the ProtoMonAgent system service on every computer you wish to monitor. This service is totally free, and you may install it on any number of computers you need. All size-related macroes have the additional modifications with the Kb, Mb and Gb postfixes. For example Memory[TotalGb] returns the total RAM size in Gigabytes.